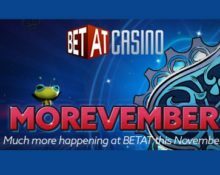 Much more happening at Betat this November! Move over October, usher in “Morevember”! More promos, more prizes and much more in line to keep all players entertained. Here are the highlights that they have stacked up for their loyal players this month. Enjoy weekly reloads, Free Spins on deposit, wager rewards and a thrilling competition for the highest win on a single spin on any slot. No time for lazy afternoons, get spinning. Not yet gaming at this award winning casino? Then sign up now and claim their superb £/$/€ 500 Welcome Package with a 100% deposit match for the first deposit and 50 Free Spins on the game of the week. Bonus terms and conditions apply. 18+ only. There is so much happening at Betat this month, it almost feels like it is Christmas already. Free Spins on Tuesdays, Live Casino Cashback on Wednesday, Deposit Bonuses on Fridays and wager rewards throughout the week. To top it all off, there will be a fierce competition for the highest bet multiplier on a single spin with the winner walking away with a cool €1,000 in cash. Claim a deposit match every single Friday, where you can nab yourself a second chance bonus to use throughout the weekend. Only available on Fridays, ranging from 50% – 100%, based on a player’s activity in the casino. Wagering requirement is 30x bonus with only bonus funds contributing. Winnings from cash bets can be withdrawn at any time as long as the bonus balance has not been used. Bonus terms and conditions apply.